FITS 11-16 GM CHEVY 6.6L DURAMAX FLEECE CP3 CONVERSION KIT WITH CP3K PUMP. We at USA Freedom Diesels are dedicated to make you the customer happy at all costs! If you don't see something you need. We will happily list it for you! FLEECE FPE-LML-CP3-FF-3K LML CP3 CONVERSION KIT WITH CP3K PUMP. Why convert your LML's Fuel System from a CP4 to a CP3? The stock CP4 is only capable of supporting up to 500rwhp. The included Fleece Performance CP3K is capable of supporting 650 rwhp in conjuction with the piezoelectric injectors. The CP4 was introduced as a cost reduction to the LML platform since a smaller amount of fuel is required when running the more efficient piezoelectric injectors. Since its introduction it has proven to be less reliable and less capable than the CP3 used in previous duramax platforms. Includes Fleece CP3K CP3 Pump. 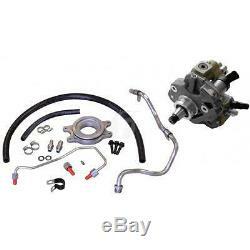 Includes Fuel Line, Adapters & Hardware. This product is not legal in the state of California. When used incorrectly this product may violate local, state, and federal laws pertaining to emissions, traffic, registration, and safety. Use of this product may damage or destroy mechanical and/or electrical components of this vehicle. User understands that motorsports are dangerous, and that installation of this product may subsequently require special driving skills or techniques to safely operate the vehicle. User assumes sole responsibility for the safe, proper, and legal use of the vehicle at all times. The purchaser and end user releases, indemnifies, discharges, and holds harmless Fleece Performance Engineering, Inc. Will not be liable for any direct, indirect, consequential, exemplary, punitive, statutory, or incidental damages or fines cause by the use or installation of this product. This product may not work with the EGR cooler installed. It may need to be removed. This product MUST be used in conjunction with custom tuning calibrations from Fleece Performance. Failure to install the correct calibrations can result in engine damage. Not legal for sale or use in California on pollution controlled motor vehicles. The item "FITS 11-16 GM CHEVY 6.6L DURAMAX FLEECE CP3 CONVERSION KIT WITH CP3K PUMP" is in sale since Friday, July 28, 2017. This item is in the category "eBay Motors\Parts & Accessories\Car & Truck Parts\Computer, Chip, Cruise Control\Performance Chips". The seller is "usa-freedom-diesels-inc" and is located in Missoula, Montana. This item can be shipped worldwide.